Happy Monday! I’ve been sick with an awesome cold the last 5 days. 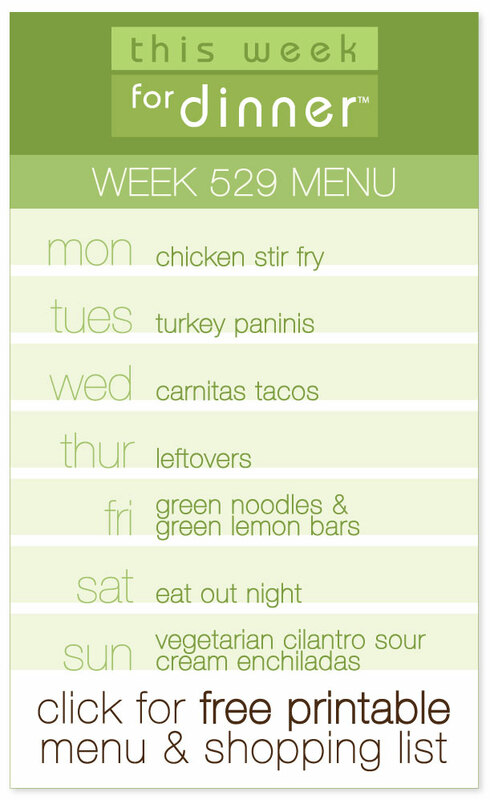 I’m finally feeling somewhat normal again, which means time to plan this week’s menu! The kids were so cute the other night, stepping in to help make dinner on a night when I was stuck in bed. All of that time spent cooking with my kids is paying off! You know the drill! Share your own menus in the comments! And have a great week! Jane, I was inspired by your kids cooking for you. So, my 8yo went to “Knife Skills Boot Camp” to help make dinner on Sunday. She LOVED it!! Can’t wait to do more cooking! that so so awesome! LOVE IT! I would love to do a knife skills boot camp with my kids…need to look into that! and glad that “recipe” was helpful for your husband, yay! I was sick last week and all weekend too :(. Must be going around! Tuesday: Cauliflower Shawarma Tacos (Not Without Salt)–So Delicious! I think it DEFINITELY is! such a drag! I was sick too…Ugh! Glad you’re feeling better! F:. Happy St Patty’s Day! Corned Beef, cabbage, potatoes & carrots for us and green noodles and carrots for the little one.